Ducati #2 Windshield or Trailer decal 4" X 36"
Hayabusa Fairing decals 10.5" X 11"
2 FULL COLOR PRINTED 8" X 8" Zombie Outbreak Response Team #3 trailer, or window Universal Graphic Decal ! Ducati trailer decal Size 6" X 44"
out there just cut to fit! Fits all year Monsters and we have also used them on the 749 and 998! 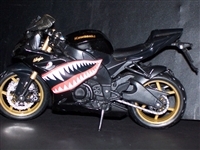 This set includes the flames for the fairing shown plus Flames to put on your tail section SWEET! FITS ALL SPORT BIKES OR ANY BIKE WITH A FAIRING! This set includes the flames for the fairing shown on Sportbikes and Can be used on the tank and Fenders on all Cruisers SWEET!